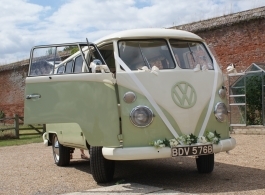 A beautiful, retro 1964 Splitscreen VW Campervan for wedding hire. This lovely wedding Campervan is finished in Pistachio Green and Cream and comes decorated with Cream ribbons and Green and Cream flowers. (alternative colour schemes may be available upon request). The trendy interior of this wedding Campervan can take a maximum of 6 passengers with 5 fitted seat belts.